Set here and there amongst the walled fields of Hvar’s agricultural landscape, you’ll see stone shelters. I’m not talking here about the newer type of weekend houses that have sprung up – complete with BBQ and shady terrace for Sunday lunch. No, the ones I mean are much older, of drystone construction, and some have been there for centuries. It’s apparently quite hard to tell when an individual structure was built, as some can date from prehistoric times, while others might be medieval or later. The architecture doesn’t tell you, you have to go by any artifacts you can uncover on the site. 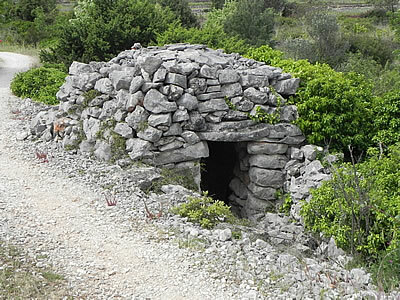 The local Hvar version of a stone field shelter is called a trim (pronounced treem). It’s round, made mostly of rough stone, with the only dressed stones forming the doorway. The roof is corbelled – which is to say built from layers of flat stones gradually sloped in towards the centre. It’s not a true arch, since there’s no keystone. Typically, the cross-section of the shelter forms an equilateral triangle – any lower and the roof would fall in, any higher is a waste of effort! The roof sometimes forms a flat spiral, which can be useful for drying fruit. 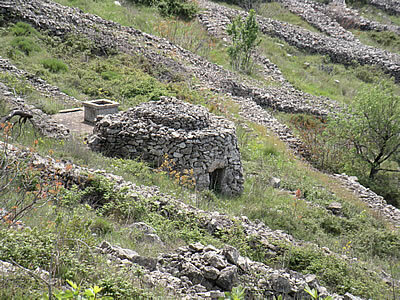 More than 90 trims have been documented in the Stari Grad Plain alone, and they’re also pretty widespread in the hillside fields. Next to the trims, you may see a cistern for holding rainwater. That’ll be a flat roof with a covered hatch. All up and down the Croatian coast similar stone shelters can be seen. Over by Šibenik and Zadar, they have square versions as well as round ones, and they’re known as bunja. In Istria, they’re known as kazun, and on Krk, they’re called komarda. 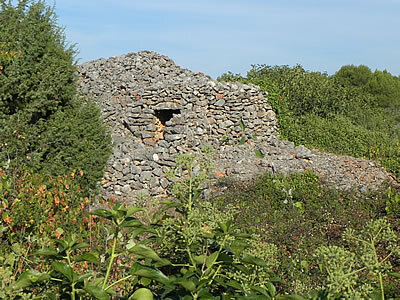 This type of stone field shelter is, in fact, very widespread all the way around the Mediterranean, and as far north as Scotland and Ireland. Stone buildings really last! Thank you! The stone shelters do fit very naturally into their environment, and add to the character of the place. Once you start looking, you can see them everywhere. Sadly, and somewhat predictably, many are now falling into disrepair or being demolished. Perhaps if more visitors to the island took an interest, the locals might see the value of them. Let’s hope so! I chanced upon this and I found it extremely intriguing – I’ve never paid attention to stone shelters. They look amazing, they blend nicely into the surroundings! And now I’m learning something new from your blog! Great one there, thanks for sharing!